Natzke, Elloitt are state Holstein Boy and Girl. Junior Holstein Convention held Dec. 28-30 at the Plaza Inn and Suites in Eau Claire. The event was hosted by the Clark County Junior Holstein Association. Throughout the convention, Junior Holstein members participated in numerous contests, including dairy quiz bowl, public speaking, arts and crafts, photography, and dairy jeopardy. The largest competition was dairy quiz bowl, in which 26 junior and 26 senior teams competed. A junior team from Manitowoc County and a senior team from Polk County earned the honor to represent Wisconsin at the National Holstein Convention in June. 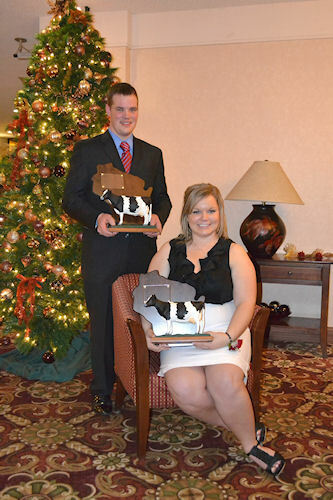 STANDOUTS: Kyle Natzke of Fond du Lac is the 2012 Wisconsin Holstein Boy, and Laura Elliott of Marshall was named the 2012 Wisconsin Holstein Girl. Manitowoc County junior team members are Jake Siemers, Jordan Siemers, Josh Siemers and Bieke de Bruijn. Polk County's senior team includes Brett Getschel, Cody Getschel, Chris Rassier and Ethan Dado. Taking second place in the junior division was a team from Dodge County. The second place senior team was from Vernon County. For teams to compete in the dairy bowl contest, each member must take a seating exam. Those individuals scoring highest are recognized with awards. High scores in the junior division went to Jordan Siemers of Manitowoc County, Matthew Kramer of Fond du Lac County, and Kenni Bores of Wood County. Recognized for high scores in the senior division were Jessica James of Iowa County, Matthew O'Leary of Fond du Lac County and Dane Thompson of Barron County. The highlight of the convention was naming the 2012 Wisconsin Outstanding Holstein Girl and Boy. Kyle Natzke of Fond du Lac County is the Outstanding Holstein Boy while Laura Elliott of Dane County is the Outstanding Holstein Girl. Others who received the Distinguished Junior Member award include: Cara Biely, Menchalville; Amelia Cooper, DeForest; Laura Finley, Lake Mills; Rachael Hartlaub, Cleveland; Brett Hildebrandt, Hustisford; Jake Hoesly, Brodhead; Nathan Huser, Vesper; Karsen Haag, Mount Horeb; Mitchell Kappelman, Manitowoc; John Klossner, New Glarus; Bryce Krull, Lake Mills; Cassandra Krull, Lake Mills; Thomas Larson, Viroqua; Bret Long, New London; Morgan Lundy, Jefferson; Stephanie Nagel, Valders; Andrea Pagenkopf, Lancaster; Katie Wendorf, Viroqua and Kayla Wright, Watertown. Cooper, Stephanie Nagel, Kyle Natzke and Kayla Wright were all chosen to represent Wisconsin as Distinguished Junior Members. The Younger Member delegates include Katherine Larson, Elizabeth Sarbacker, Jordan Siemers and Nicole Wright. Junior members recognized for 12 & Under award recognition were: Cole Booth, Plymouth; Jenna Broege, Janesville; Madison Calvert, Cuba City; McKenzie Calvert, Cuba City; Abby Field, Reedsburg; Grant Fremstad, Lone Rock; Kaianne Hodorff, Eden; Kalista Hodorff, Eden; Brian McCullough, Juda; Rachel McCullough, Juda; Lindsey Sarbacker, Floydholm; Connor Siemers, Newton; Alli Walker, Wisconsin Dells; and Collin Wille, Rice Lake. The 2012 Wisconsin Holstein Association Princess and Attendant also were crowned at the Saturday evening banquet. Laura Finley of Jefferson County will serve as the WHA Princess and Anna Blake of Waupaca/Waushara County will join her as the Princess Attendant. All juniors at convention had the chance to compete in the Dairy Jeopardy competition. The top competitor in each of three age brackets has the opportunity to compete at the national convention. Qualifying this year was Jake Siemers of Manitowoc County in the junior division, Crystal Siemers-Peterman of Manitowoc County in the intermediate division, and Kyle Natzke of Fond du Lac County in the senior division. Placing second and third in the junior division were Adam Field of the District 5 Junior Club and Kylie Nickels of Dodge County. In the intermediate division, Jordan Siemers of Manitowoc County took second, and Andy Sell of Dodge County was third. In the senior division, Stephanie Nagel and Rachel Hartlaub of Manitowoc County placed second and third, respectively. In the speaking contest, Wisconsin can send up to three delegates in each division to compete at the national convention. To compete, youth must prepare a speech on a topic related to the dairy industry at a length assigned to their specific age division. Heading to national convention are Reece Lehman of Trempealeau County, Courtney Moser of Vernon County and AbbyField of the District 5 Junior Club in the junior division. Kati Kindschuh of Fond du Lac County, Jordan Siemers and Barloe Brisson of Manitowoc County qualified in the intermediate division. Representing the senior division will be Kaitlyn Riley of Crawford County, Laura Finley of Jefferson County and Rachel Hartlaub of Manitowoc County. Wisconsin Holstein awarded nearly $12,000 in scholarships this year, and following the award presentation, an auction was held to raise funds for future awards. High school seniors, short course, and two- and four-year college students that are members of WHA are all eligible for these scholarships. Those members receiving scholarships to four-year colleges and universities include: Laura Elliott, Marshall; Breinne Hendrickson, Belleville; Josh Joseph, Viola; Erin Kappelman, Two Rivers; Cassandra Krull, Lake Mills; Stephanie Nagel, Valders; Ryan O'Leary, Brandon; Kathryn Wendorf, Viroqua and Abbey Wethal, Brooklyn. Receiving two-year scholarships were: Austen Schmidt of Cascade, Lexa Miller of Vesper and John Kosmalski, Rosholt. The Wisconsin Junior Holstein Association awards interested juniors the opportunity to travel to an area of the state to tour farms and learn from their dairy operations. This Farm Tour award was given to twelve recipients including Morgan Lundy of Jefferson County, Theresa Madland of the District 5 Junior Club, Tony Weier of Iowa County, Brooks Hendrickson of Green County, Riley Bricco of Shawano County, Elizabeth Sarbacker of Dane County, Cassi Miller and Jackie Breuch of Wood County, Kati Kindschuh and Derrek Kamphius of Fond du Lac County and Joshua Butler and Andy Sell of Dodge County. The group will be traveling the state early this spring. The convention concluded Friday morning with an awards breakfast and the annual business meeting, where four new Junior Activities Committee (JAC) members were elected. The JAC group is responsible for coordinating and overseeing all junior events within the Wisconsin Junior Holstein Association. Selected this year for the southwest district was Andrea Pagenkopf of Grant County, Ryan Pralle of Clark County for the northwest district, John Klossner of Green County for the southeast, and Nicholas Schuster of Fond du Lac County for the northeast district. These members will serve a two-year term as JAC's, and join second-year members Katie Wendorf of Vernon County, Cara Biely of Waupaca/Waushara County, Brett Hildebrandt of Dodge County and Nathan Huser of Wood County. For more results from this year's convention, check out the Junior Convention Report link on the WHA Web site, www.wisholsteins. com.